Here are some of our most popular items. We have a selection of Montessori style, Pikler style, and custom designs. If you do not find what you are looking for or need something customized, please inquire. We are always eager to try to expand our catalogue and reach different markets. ORDERING: Please email or Facebook message us. More information click here. 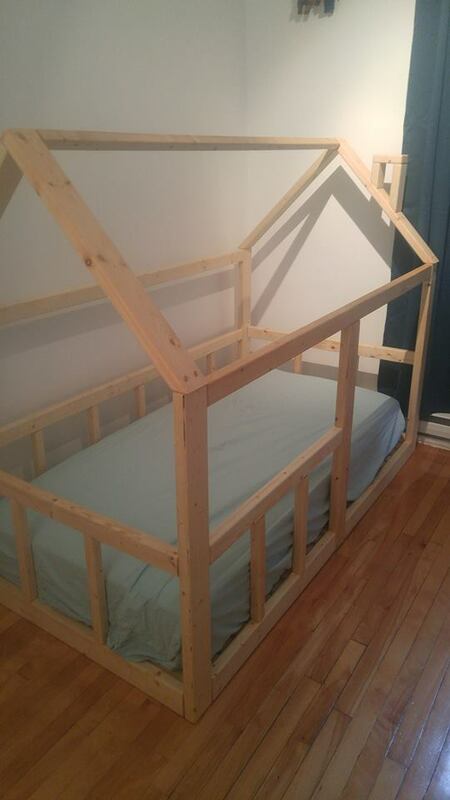 The frame is constructed with furniture grade pine. The rungs are 1.25" birch capable of holding your average 10 year old. Unit is foldable for easy storage when not in use. The ramp is reversible from climber to slide. Made with Baltic birch plywood and pine. Available as sanded no finish, or with a linseed oil and pine varnish (low VOC, organic, food grade). The triangle is approx 31" wide x 31" deep x 31" high. The ramp is 19" x 60". When open, the unit is approximately 19" x 19" x 41". Closed 19" x 41" x 3". Made completely out of Baltic birch plywood. A linseed oil and pine resin varnish is standard. It can for sure support up to around 200 LBS. 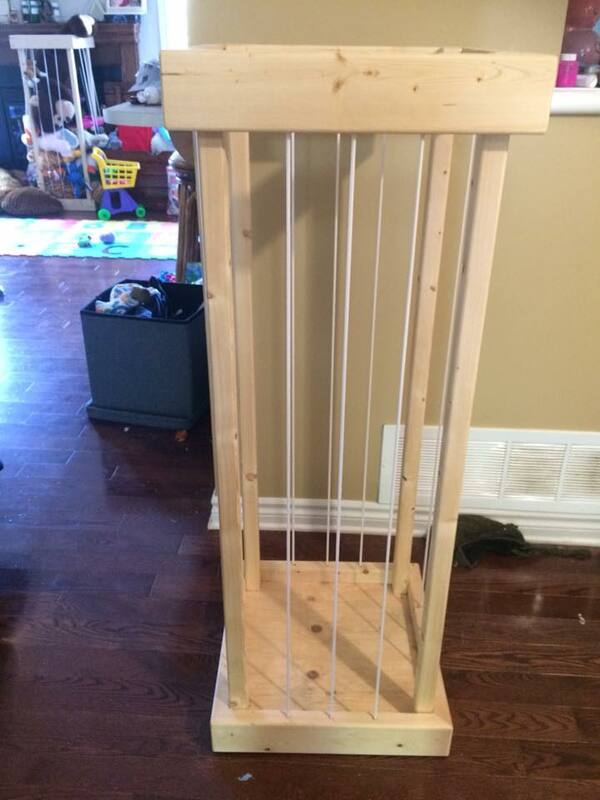 Approximately 14" x 36" x 7"
These are a cute little addition to any play area. They are able to be used as a chair, or flipped into a table. The seat is off centre in height, so it can be low for younger children, then flipped over to a higher seat. All baltic birch plwood. A solid and stable rocker, great for 1-2 children. 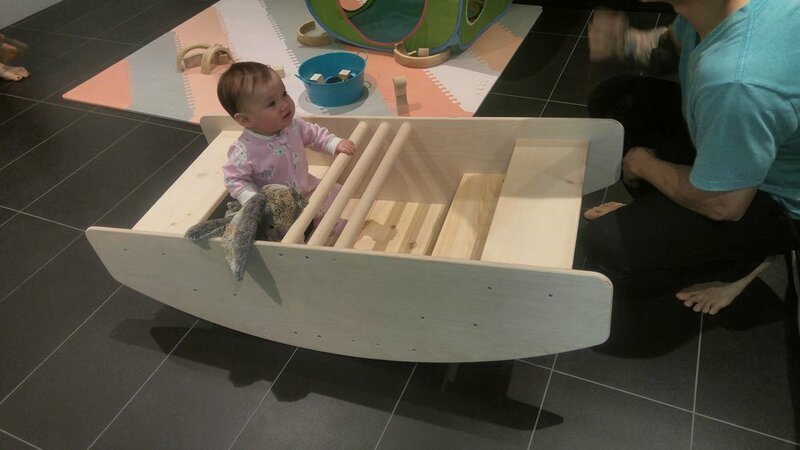 The rocker can be flipped over and used as a short climber. Also it is wide enough that our reversible ramps can be used with it. It has been extensively play tested to make sure it will not flip over when rocking. The sides are Baltic birch plywood, the dowels are solid birch, and the slats for foot rests are white pine. Please inquire for flat pack version pricing if shipping is required. Our most popular rocker, and absolute classic. Depending on your children's size, can fit 2-4. Also can be flipped over and used as a stepping bridge. Our QA department almost seems to prefer it in bridge mode. The above picture is with a happy customer approving of the rocking. The sides are Baltic birch plywood, with solid birch dowels, and white pine for the steps. Low to the ground, and can be customized to your size requirements. If a larger mattress or railing is required, please ask for pricing. We tend to sell more of these in Montreal then anywhere else, so do not be afraid if your outside of Ottawa, we will get it to you and set it up. Our standard, but by no means in stone design is for a adult twin mattress. The rail height is 18" high, and the opening is about 33" wide. The opening tends to be on the right, but please ask if you want it on the left or foot. We use to offer a discounted version in construction grade spruce, but that was proving to be a hassle to sand and make presentable. We now only use pine as our standard. Other woods can be priced. Custom finishes available. Please inquire. Not a common request to us, but we sure do love making them. We have no standard, all designed to order. Many have been made over the years, but somehow only one has been photographed. The above was a request for a Mr. Dressup Tickle Trunk style. Priced to order. Please check back periodically for a new addition. We do not have a large gallery at the moment, but we will build you anything, as long as it is safe. We enjoy designing to need and desire. If you see something online (Pintrest!) do not feel embaressed to forward to us. We will do our best to copy it, and suit it to your budget. This one can be a sanity saver. Easy to put all of you stuffed animal "friends" inside. Can be customized in size. The sides are white bungee chord. Dimensions: 18" x 18" x 48"